The supporting events included the first international sailboat race, which the British were sure they would easily win. In one of the great sports upsets of all time, the highly coveted silver cup was won by the New York Yacht Club’s schooner, America. The crew donated the trophy to the yacht club, to be held as a “challenge trophy.” The America’s Cup was born. The race was named after the first winning boat, not the country. It is the longest-running sports event in history. America’s Cup is the most prestigious regatta and match race in the sport of sailing. The New York Yacht Club successfully defended the trophy until 1987. The last 30 years have seen enormous international competition for the coveted cup. This poster shows all the winners. It even includes the winner of the recent 2013 race. It is the first time that all of the winners have been shown together in any media. 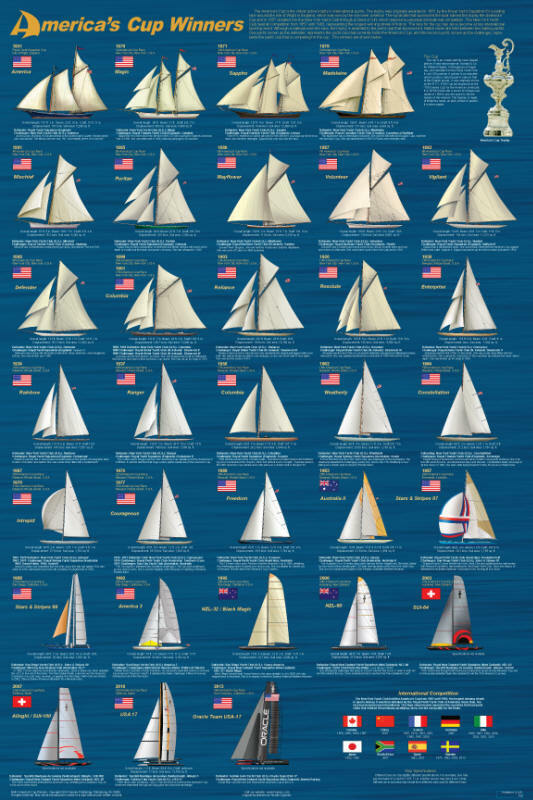 The international flavor of recent races is represented by including the flags of countries that had participating yacht clubs even if they did not win.